Human body was designed (loosely speaking) for one certain way of standing and moving. All other ways are sub-optimal or flat out wrong. I know there are people who do not like this fact; but fact it remains. There is no exception. People with poor body mechanics have poor performance. Unfortunately, some coaches do not understand this: Is it easier to label the person as 'not having talent' for certain sport. But, not having talent often amounts to just poor body mechanics, that the coach is unable to diagnose or correct. Let us move on to capoeiragem. Simply put, capoeiragem techniques are very sensitive to proper body mechanics. Strictly speaking: Capoeiragem techniques are sensitive to the symptoms of poor mechanics prevalent in modern society. That means, an average contemporary white person has a hard time making the capoeiragem techniques work. Also for that reason, capoeiragem techniques are excellent measures of effective body mechanics: If some technique doesn't work for you, it means something is wrong with your body posture or the way you move. And you should correct that. Consequently, that means if you master capoeiragem, you will, at the same time, master your own body; making it perform optimally. Unfortunatelly, i also means that for average person, learning capoeiragem is hard; not only physically, but mentally; because first of all, he has to learn how to stand and move. Sorry, capoeiragem is not a 'relaxing' activity. You cannot just 'enjoy yourself'; you have to work hard. Only cheap things come cheap. Lot of people today cannot move their scapulae correctly. Worse, they seem to not even know that they should be able to move them at all! Immovable scapulae in capoeiragem have truly disastrous results: Bandas do not work. Cabecadas do not throw. Etc. In some people, the scapula is permanently frozen in the upward-forward position; which results in the infamous hunchback position: round back, head forward. But of course, it can be frozen in any other position. If you cannot move your scapulae, you cannot do capoeiragem (or any sport, for that matter - properly, that is) - it is that simple. So, what to do about it? Let us start simply - by moving the scapulae! Most people can already move their "shoulders" (in reality, scapulae) up and down. However, we are looking for the neutral (down-most) position for the next step. So try to relax and stretch your upper trapezius as much as possible, thus getting your shoulders as low as possible. Keep the neutral position of the shoulders from (1). Keeping scapula down from (1) and rotated down from (2), try moving it forward and backward; which feels like 'rounding the back'. Simply try to touch close your elbows together in the front of your stomach, without lifting them upward; then spread them back. It is possible that everything is so tight up there you cannot even move an inch. Do not despair and keep trying! We are looking for full back-forth movement, while holding both (1) and (2) downward positions! This movement is very important. In southern kung-fu styles, it is known as _spit-swallow_, which refers to the movement of the chest. It is the most important power source of the upper body. The movement is powered mostly by serratus anterior from the front and assortment of back muscles,including lower trapezius, from the back. 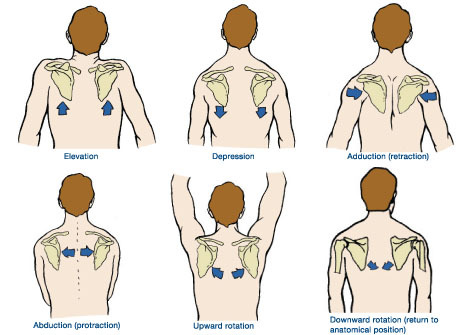 The hardest position is probably (b), where the scapulae are maximally forward(3); yet, they are also downward, so they shouldn't be allowed to rotate upward(2). This is why this position is often trained in the southern kungfu and okinawan karate kata; by holding it statically. The 'sanchin action' of karate, done correctly, teaches and uses the same principles as outlined above. First, the hikite - scapula is pulled back and rdown. Second, the strike - scapula is in front and rup. Third, drop the elbow - scapular is in front and rdown.